I built a new wall in the kitchen shortly after moving in, we had a number of spare metal studs. These things are AWESOME. They are flexible, they can be bent to shape. They're cheap (more than a wood 2x4) but a fraction of the weight and they can be manipulated with tin snips and a pack of metal screws. I had some other bits around-- some wood, some screws and the like. I thought I could turn it into a greenhouse on the cheap. I needed plastic to cover the greenhouse, so I had to buy that (about $30 and I used only 2/3 of the roll). I bought some more screws ($12). I bought some hinges ($9). Otherwise, I had what I needed from scraps. I needed help to build the walls-- the long walls were 6 foot X 6 foot. The short wall was 4 foot wide and 6 feet tall. With some help, I was able to screw the walls together. They were kind of parallelogram, but that was okay. I eventually squared them up enough that they worked, using cross beams. I used three lengths of metal studs to form up the roof. I intended on making this cool rounded roof. I got impatient and tired, so I just went for basic roof with a few bends in it. I did buy a little vent and I have a fantasy of installing this funky way to open the vent when the temperature rises (yeah, my fantasies are lame). Wherever I had a sharp or pointed edge, I wrapped it in duct tape. While the photos will show that I was not using gloves, that is a MAJOR mistake. Use gloves if you try this. I implore you. But really: when in doubt, use duct tape to soften and defang the edges. I was foolhardy enough forego the gloves-- my hands are slashed six ways from Sunday and I was good enough to puncture myself with the drill a few times. Always fun! I wrapped it in the plastic sheeting. I screwed up the length, so I had to cut an additional piece to get around the whole of the greenhouse. I locked down the plastic with screws. Each screw had a cushioned washer to make a nice snug hold on the plastic without tearing it (we'll see what happens in November). I kind of screwed up the wrapping job, but I was able to lock down the plastic at the front with a spare piece of wood. I filled the big hole with a door I built out of the last of the metal studs. Because of the funky angles to the greenhouse, I positioned the door and then put in a couple cross beams to position the frame and lock it down. 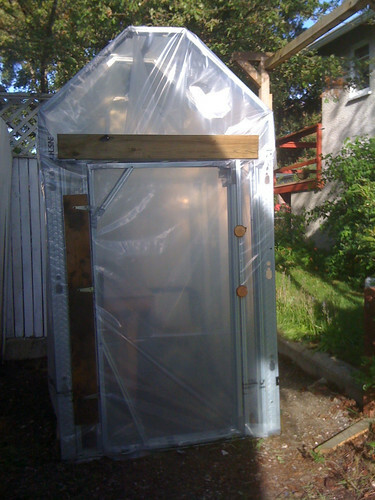 Next, I wrapped the door in plastic, screwed down the plastic and used duct tape judiciously. With some struggling I was able to mount those hinges and voila! A door! To seal the door, I took two of the burls I had cut from a branch that fell in our back yard during the winter. 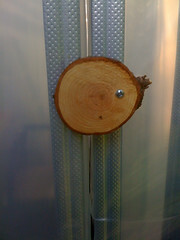 I mounted the off center with a spacer so that I could spin it in to block the door, or out to let the door swing open. Inside, I used a workbench I built 18 months ago to house some of the plants. I want to grow tomatoes and peppers in the greenhouse. Again, with the cheapness / thrift, Instead of buying planters, I used some plastic cat litter bins as planters. To hold in the heat, I spray painted the outside of the planters black. 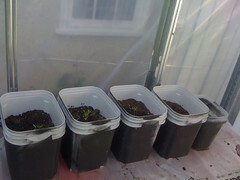 My niece and I transferred some seedlings into the planters to give them their new home. Keep in mind that I was able to scrounge most of the stuff from other projects. The key to this is to scrounge. Did you reno your house leaving you with old windows? Work them in! Found 2x4s? Bring them to the party. I had left over metal studs, so I spent about $60 on bits that I didn't have.